The beauty ideal: April Favourites. I know I said the next time I'd do a 'monthly favourites' post I'd be 22 - I'm not 22 yet (Wednesday 29th), but I've just got so much to do over the next few days I didn't want to miss posting it before April was out. I figured today was as good a day as any to get it up on the blog - and I've just finished work for a well deserved week off. 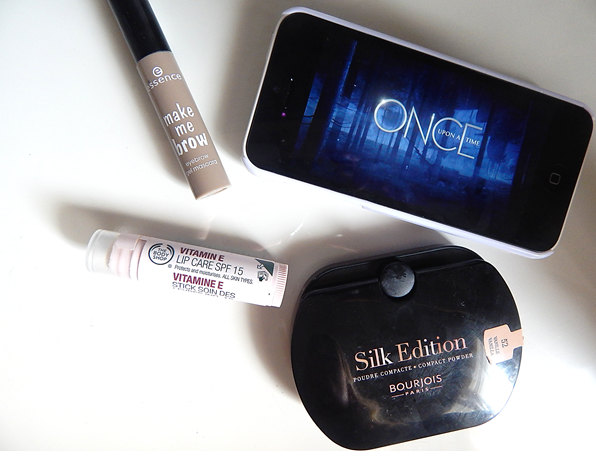 My first April fave has been the Bourjois Silk Edition Powder (£9.99). I thought I'd never find a drugstore powder I loved more than their Healthy Balance but this is definitely a strong contender. It's pretty much the same as the Healthy Balance in that it sets everything in place and keeps your oils at bay but just in a much lighter formula. Seriously, it's hard to tell you've even got powder on your face. The Body Shop's Vitamin E Lip Care (£4.50) has been a saviour to my lips this month - they've just been so bloody dry! I like to pop this on before bed and let the Vitamin E really work it's magic. Results? I wake up with baby soft lips and not a dry patch in sight. My brows have been loving the Essence Make Me Brow (£2.50) all throughout April - and so have I! It makes my most arduous makeup task a complete doddle. I've just been wearing this on it's own most days. It provides just enough colour and texture to get away with. Lastly has been a TV (or Netflix) favourite and that's Once Upon A Time. I am completely, ridiculously, embarrassingly hooked on this show. I mentioned it in a previous post and a couple of days later decided to give it a proper go - I've never looked back since. If you're into fairytales and stories with a twist then you need to give this one a watch - and Robert Carlyle is outstanding as Rumplestiltskin. It's been a relatively quiet month this one - well, until this weekend when things are probably going to go slightly downhill on the quiet front. I always like trying new lip balms (because I put it on constantly) so I'll definitely be looking out for the body shop one!